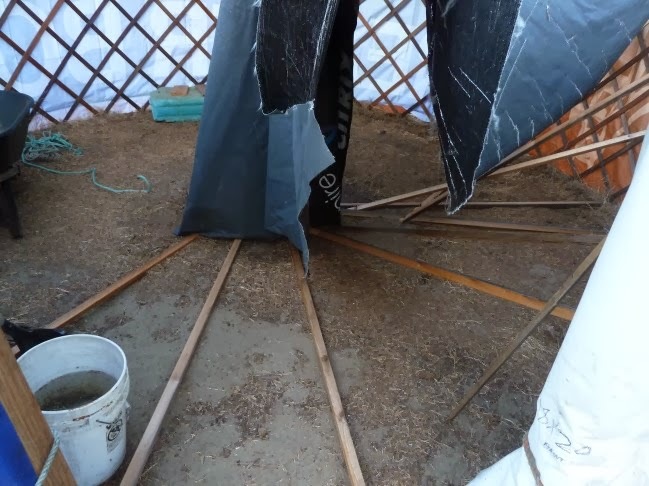 The fire in the yurt test went well as reported in my previous post, but the guys at the shop were put off by the burnt potato smell left behind by the fire. I told them that I would be getting a stove, but shopmate Tim said that we could make one on our own. I told Tim that he could because I don't know how to make a stove from scratch. Tim, said, let's go and off we went. 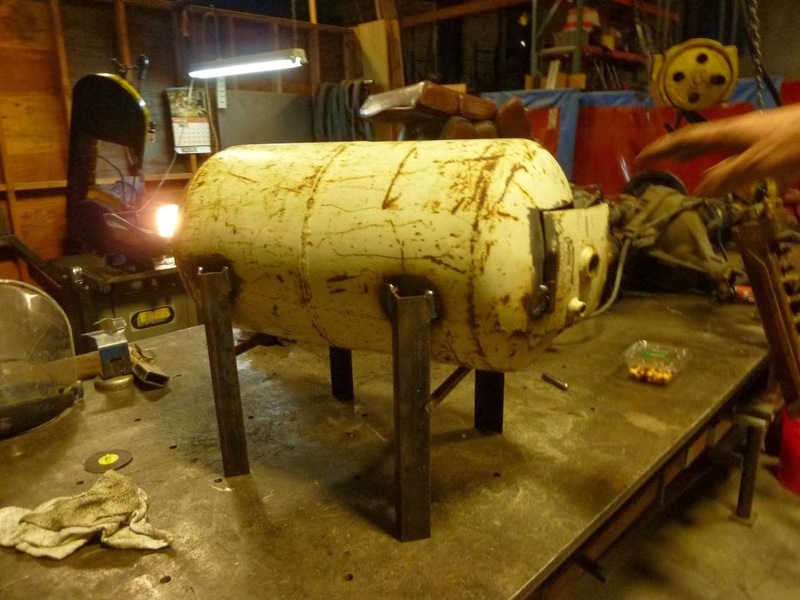 Chris, another guy at the shop donated a propane tank as the shell for the stove. Progress so far documented below. Tim cutting an opening for the door of the wood stove. 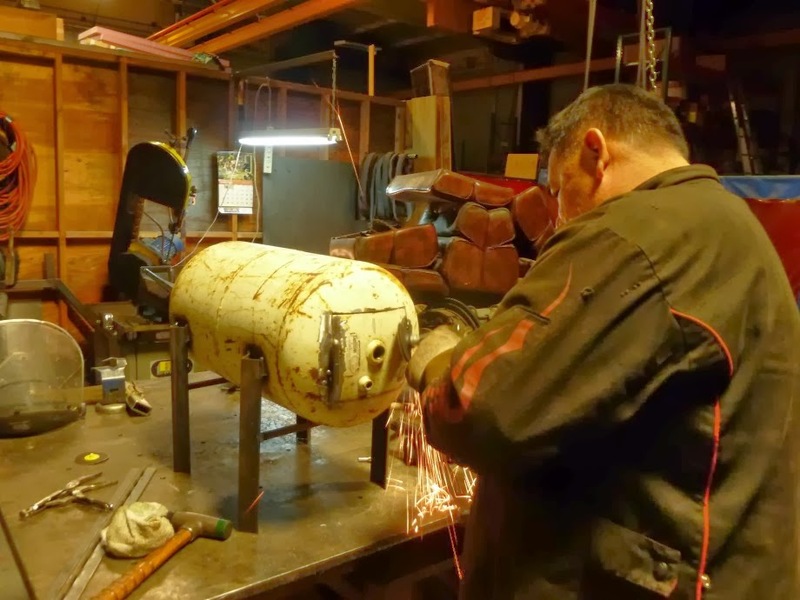 Before we got to this point we had to vent the tank to let remaining propane escape, torque off the valves and flush the tank out with water to force all the propane out. Tim did the cutting with the tank filled with water. Les is grinding away tack welds he put on to hold the door in place while he welded on the hinge for the door at the left. Legs are already welded on. Legs were cut from scrap angle iron. It's good to have scrap laying around and neighbors who can weld. And there it is, a small stove that looks like a bulldog. 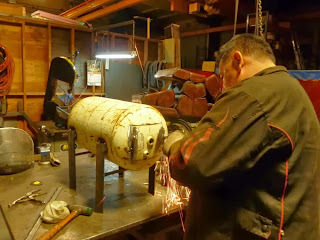 Still remaining to be fabricated, a latch for the door and a hole cut in the rear and a flange for attaching stove pipe. Another update on the yurt. As my shop mate Tim said, I liked it better when you were building boats. 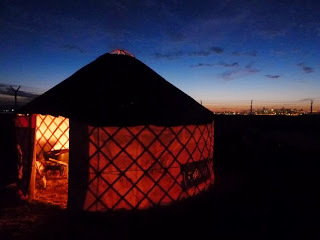 Still, yurts is what you get for now. This report is on the fire test, that is, on a test of whether I could build a fire in the yurt without choking on the smoke. But first, some outside views of the sixteen foot yurt with a skin on it. This skin consists of big plastic banners that have done their duty. They consist of a fabric substrate that is then coated with some sort of plastic. On this, the graphic is printed. And when the date for the advertisement expires, they are tossed or handed off to some recycler. I got these from my friend Tim who got them from a neighbor. So yes, they're recycled. I don't know why, but this particular skin gives the yurt a decided third world look. 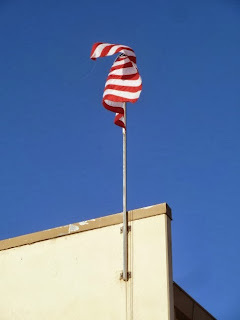 Maybe it's the ragged edge on the roof and the dirt on the white banner and the advertisement on the outside. Looks like a place where you could buy used motor oil. With just the white wall showing, the place looks a little more dignified. 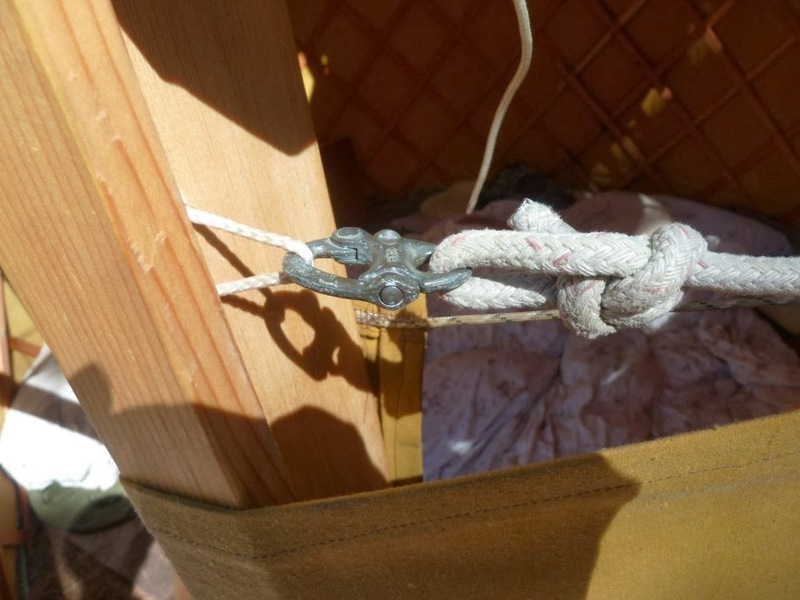 Ropes that hold the roof and the wall in place courtesy of a friend who sold his sailboat. Also ropes abandoned by fishing boats and washed ashore at Point Reyes National Seashore. As I said, this is a test, the 16 foot yurt being a prototype for all aspects of the yurt technology. So far the test of the banners as a covering material has gone on for about a year. I have already been using the banners as a cover for my kayaks. 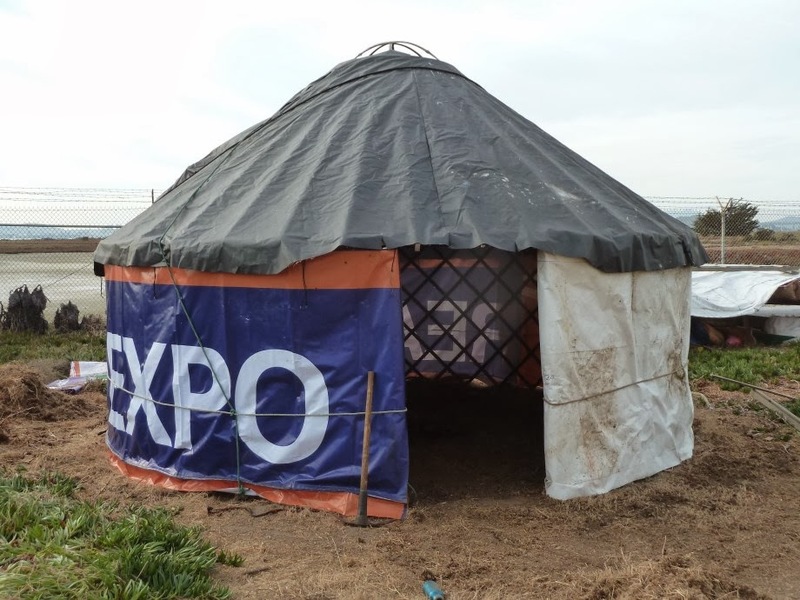 What I found out is that the plastic deteriorates within a year, probably at the same rate as those ubiquitous blue tarps sold everywhere. 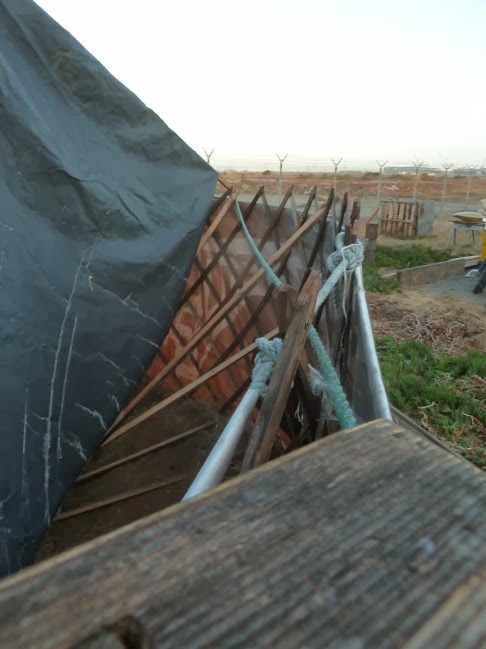 So I would probably use these plastic sheets only for temporary installations. The amount of work to do a good job on covers isn't worth it given the short life of this stuff. Still, for prototyping, they are just fine. Beside the short lifetime of the banners, another major shortcoming is that they are heavy and stiff, especially in cold weather and getting them installed is quite a chore, especially for the roof. The walls are not a problem. There the stiffness is an asset. Plus you have to not be put off by whatever commercial message is printed on the banners. And now for the fire test. The fire in progress with a bucket of water standing by just in case. Here it is, the fire. 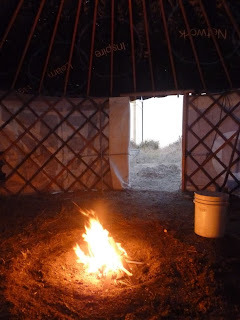 While the fire got going the yurt filled up with a good deal of smoke because the fire wasn't creating enough heat to generate a good updraft that would pull the smoke out of the smoke hole. But once it burned nice and hot, the smoke was minimal, but that was with the door open. I will have to do more testing, but I would say that with the door closed, you wouldn't really want a fire inside. But then, having a fire would hardly be of much benefit. 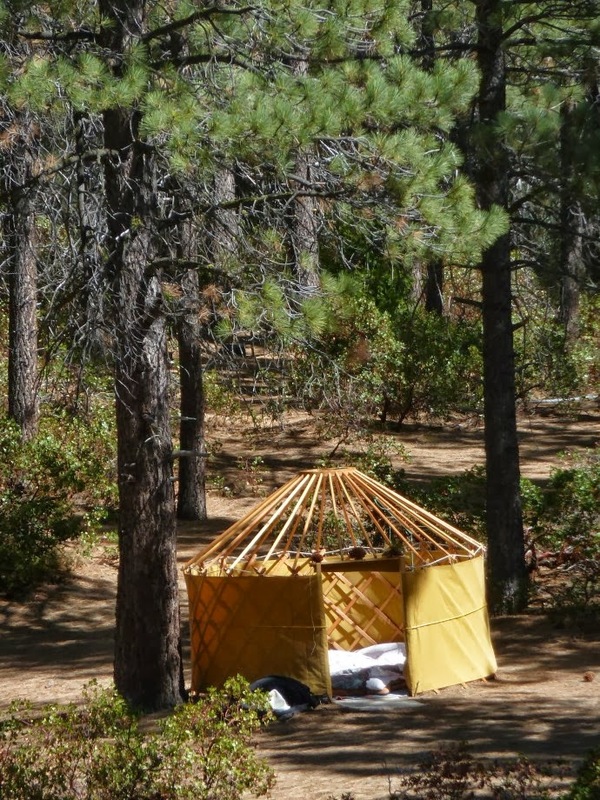 Also, this yurt is quite tall with 64 inch high walls and the smoke hole at about 10 feet elevation. So this is a fair size space to dissipate the smoke. So for now, recommendations are, keep the sticks small to minimize smoke. Get the fire going good and hot before you invite anyone inside the yurt, ideally, you would build up a good bed of embers first so any new wood on the fire would burn quickly without a lot of smoke. Or get a stove. I ordered one and will report on that soon as I get it. Shortly after sunset with some color remaining in the sky and the San Francisco skyline in the background and the tail end of Alameda in the foreground just past the yurt. 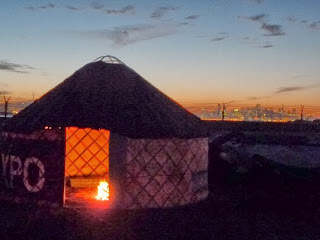 Pretty much the same shot as the one before but with the sky just a bit darker and the yurt lit up just a little more. Either I stoked the fire or the sky got darker and the camera gave the whole picture a little more exposure. In any case, the yurt is positively glowing. 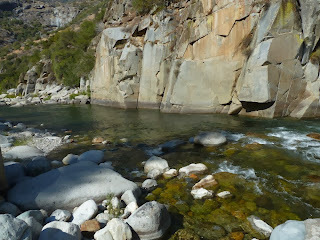 The Kings River, our destination at the end of a two mile hike downhill. 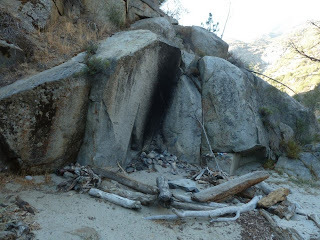 One day while camping, we found a trail that goes down to the Kings River. Not that you have to hike down to the river necessarily. There are places where you can drive right along the river. But we were looking for some exercise and diversion from sitting at our campsite and so we hiked the trail from the paved road down to the river, a distance of about two miles of switchbacks that drops you down 1000 feet to the river below. The trail is just wide enough for one person, no walking side by side. Who created the trail we don't know. It probably precedes the creation of Kings Canyon National Park, but there it is. At the trail head, our car was the only one there, so we had the trail all to ourselves. A sign posted at the trail head informed us that the portion of river accessed by the trail supports native trout and that catch and release was the only form of fishing allowed. So apparently, this trail is commonly used by fisher people. I don't know how many hikers use it since once you hike downhill for two miles you have to hike back up two miles. So we hiked down to the bottom of the river and had a lunch of crackers and hard boiled eggs. I was musing that it would be nice to also have a bottle of wine. It's nice to drink wine in a beautiful place, but experience has taught me that once you've drunk a bottle of wine, even with the help of others, hiking becomes much harder since your legs feel like lead and are much harder to lift than when you haven't been drinking. 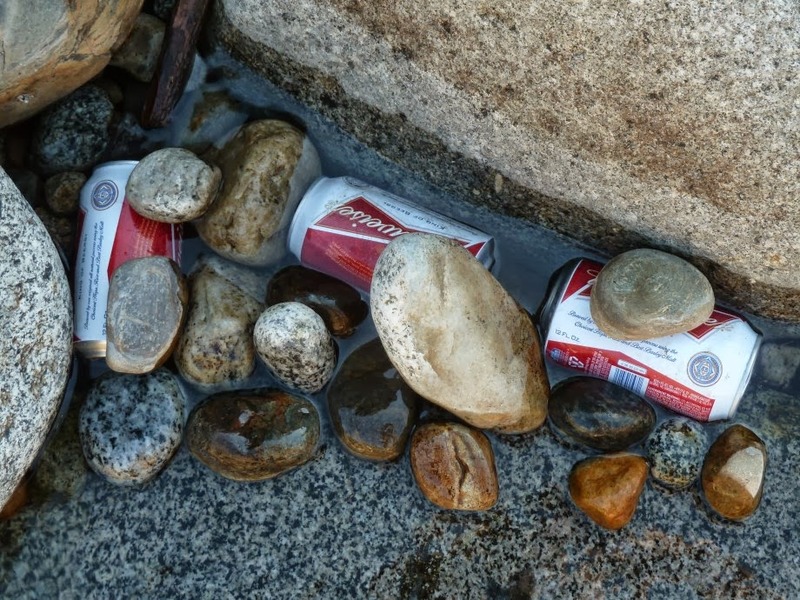 After our little lunch, I did some exploring around the next bend of the river and tucked in next to a large boulder was a pile of litter spilling out of a plastic cooler. The litter consisted mostly of aluminum beer and soda cans, some empty plastic chip bags and some plastic catsup and mustard bottles with chew marks on them. My guess was that the chew marks had been made by a bear who had gotten into the cooler and rummaged through the contents. And when I rummaged around the cans myself, I found six of them unopened, four Buds and two Bud Lites. The bear apparently did not have a taste for beer. I looked around for a way to carry the beers back with me and found a discarded tee shirt which I turned into a tote bag. 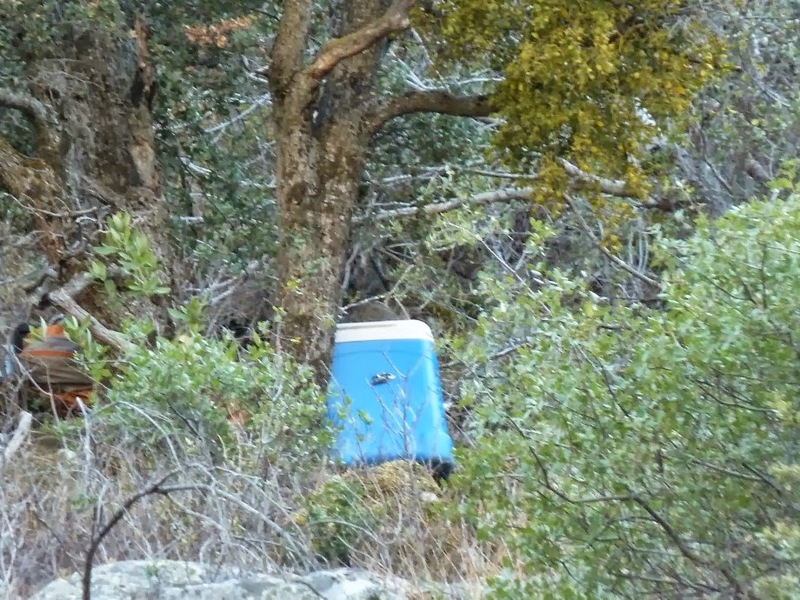 Aside from being pleased to have found some beer, I was also wondering why people would drag heavy coolers full of beer and sodas two miles downhill on a narrow trail. Apparently it was enough of an ordeal to dissuade them from carrying the empties back. 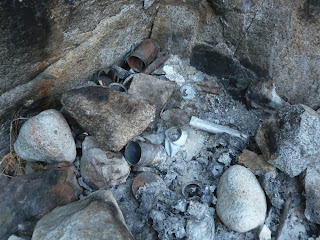 Or maybe they thought they could leave their stuff down by the river and come back another time and drink or eat what was left over. Who knows? Later, we ran into some more abandoned litter, one stash was a plastic tub full of clothes - 4 pairs of jeans, some sweat shirts two pairs of sneakers and an assortment of tee shirts and a disintegrating pair of waders. Was someone planning on living down at the bottom of the hill? Again, who knows? 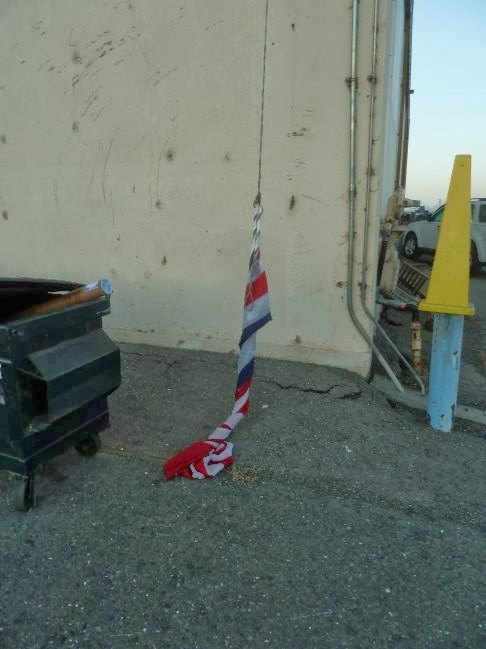 by the looks of it, the tub of clothes had also been searched by a bear. The Buds cooling in the river. I had two and Joan opened one but didn't finish it. 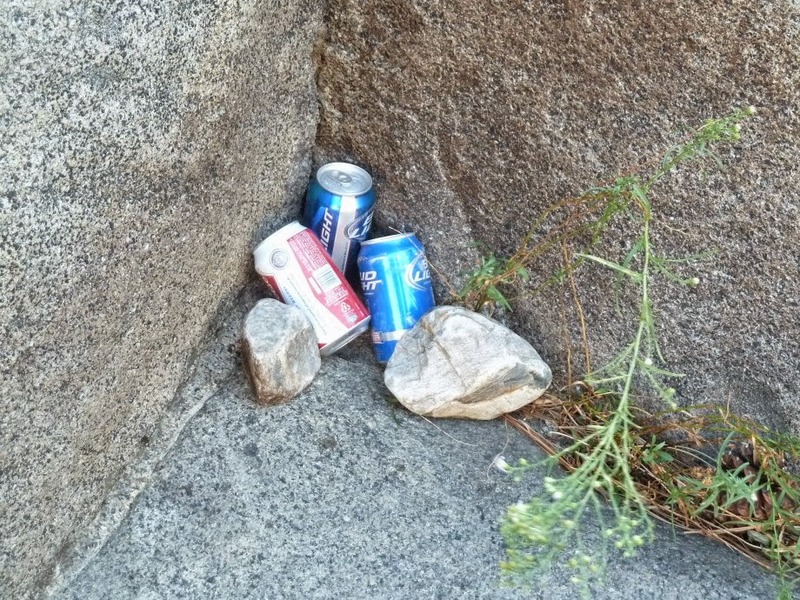 Knowing the ill effects of too much beer, we left the remaining cans for the next hiker. 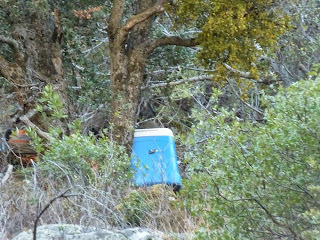 On our way out, we spotted another cooler stashed a little ways up the hill next to a tree. Seems like the bears hadn't found this one yet. Another camping spot next to the river, obviously a site for many a cookout. 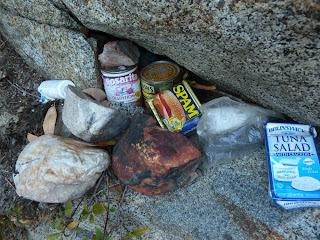 Canned food seems to be the preference on the Kings River. 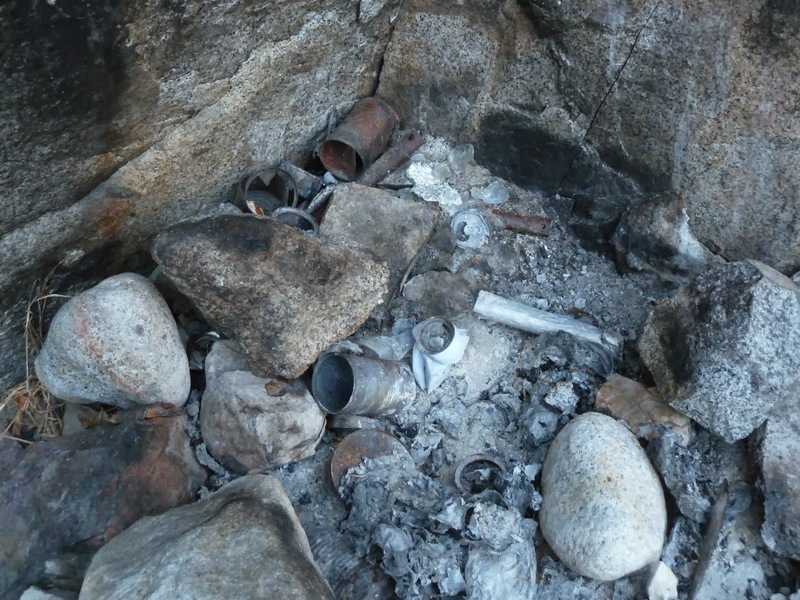 Skeletons of many cans remain in the ashes. Assorted kitchen implements generously left behind for the next person. And a few essentials, also unopened and left behind for the next visitor. So on to some possible morals of this story. Zero or more options may be true. You may be able to think of more. Option 1, maybe this story has no moral. Simply, hikers find trash left behind by other hikers/fishermen. Option 2. Sometimes when you wish for something, it appears, in this case, six cans of beer. Actually, I wished for a bottle of wine, but a six pack of beer is ok. Option 3. This particular moral relates to my previous post as space travel. When you're camping, you can't expect food to be there when you get there so you have to bring it. Option 4. The caching of food in remote location has always been a practice. 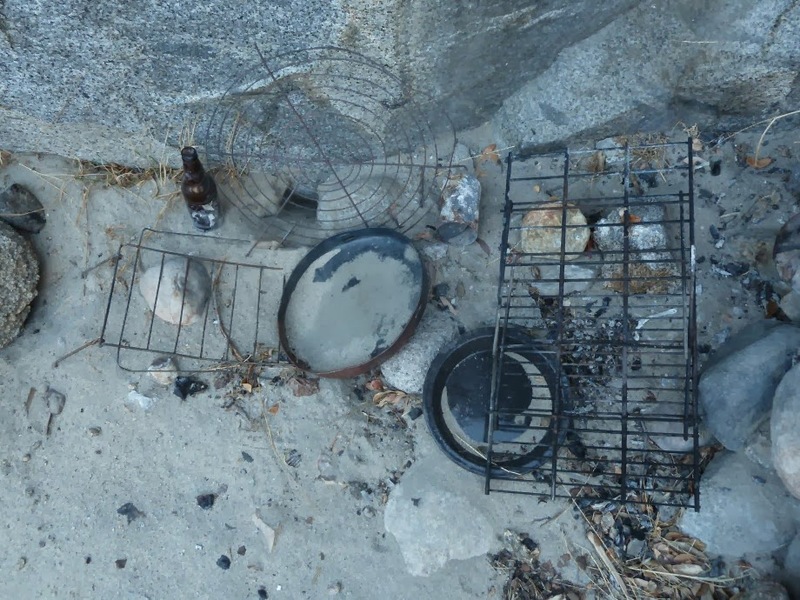 Part of wilderness etiquette has always been not to disturb someone elses cache of food. If food is cached, someone expects to find it there when they come back. If you mess with their cache, you might put them in a bad situation. If you used their pile of firewood, you were expected to build the pile back up for the next person to come that way. Seeing that whoever left the beer around, had already drunk most of it, I did not feel that I was violating their cache. 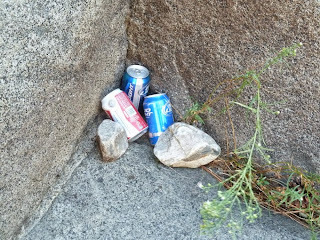 I suspect that whoever left the beer behind had had enough of it and just didn't feel like dragging it back up the side of the canyon. Option 4. 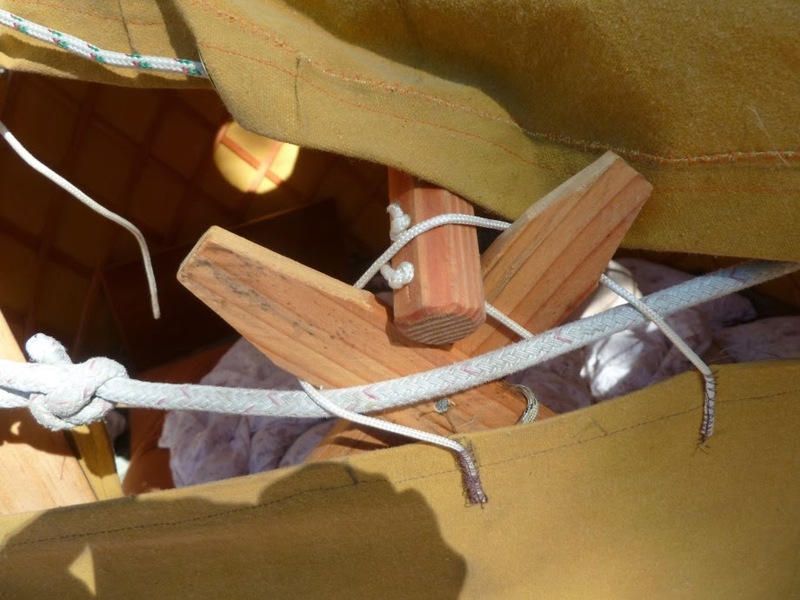 Traditional wilderness etiquette does not involve packing your trash out of the wilderness. 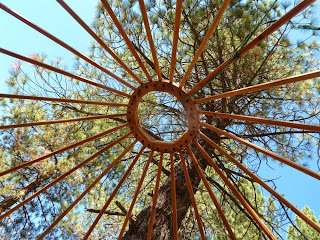 Wilderness was everywhere. You would merely be packing trash from one part of the wilderness to another. 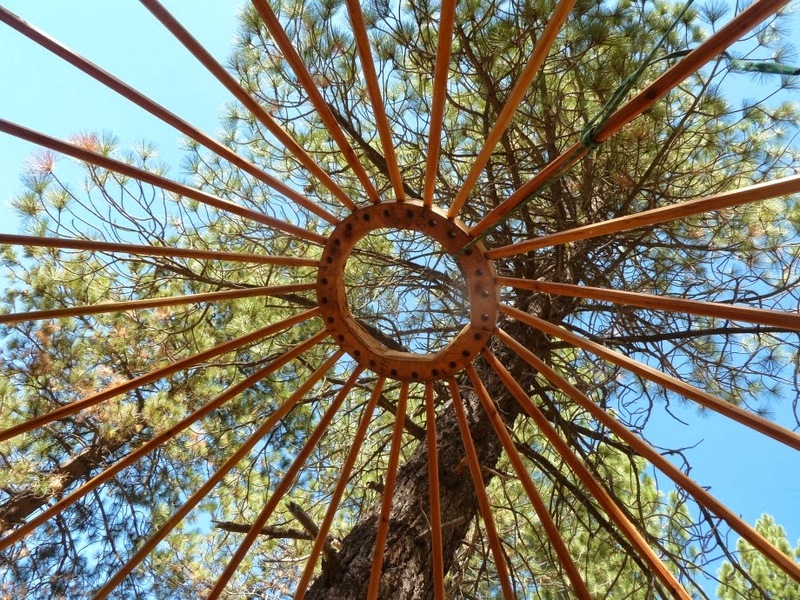 Camping is often lauded as a way for harried urbanites to re-connect with nature. Well maybe. Decades ago, I used to go on canoe trips to Quetico Provincial Park in Ontario, Canada, sometimes with friends and sometimes with family. To do these trips, we had to pack all the food we would need for the length of the trip. Not packing enough food would mean going hungry since there are no stores in the park. Then at some point, I took along a fishing rod and caught fish to supplement our meals and surprisingly, my experience of the camping trips changed. The best way I could describe the new relationship was that it no longer felt like space travel where you had to bring absolutely everything with you that you needed to survive. Once I was able to catch fish, my environment took care of some of my needs. I was not entirely reliant on my environment to provide me with food, but I was not entirely reliant on what I had brought with me either. I felt a new bond with my surroundings. My surroundings now provided for me. My presence in the wood and lake country was in a sense approved of by my environment. I could say that I now filled an ecological niche, that of a fish eater. I was no longer simply a tourist on a life line that led back to the civilized eco-niche that I had come from. Yes, I was by no means living off the land simply because I caught a few fish, but the fact that the land I traveled through provided me with at least a part of my sustenance changed my relationship with it. 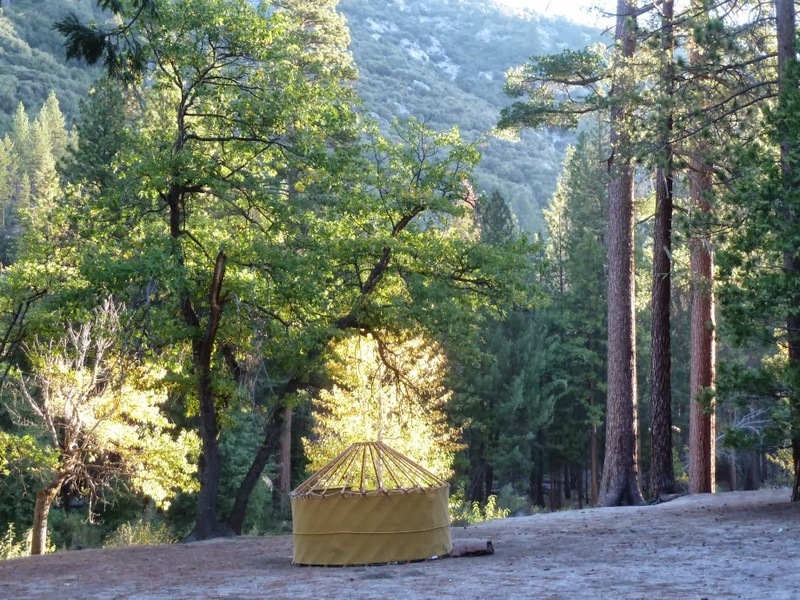 Camping in Kings Canyon, NP. 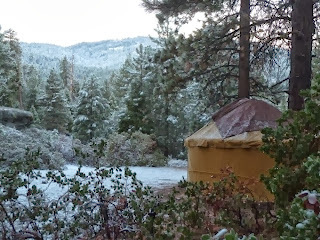 The yurt dwarfed by tall pines and the canyon wall. Fast forward to the recent past. 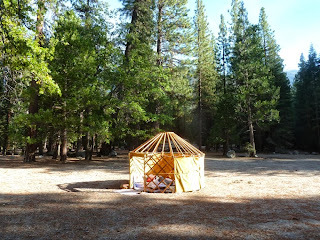 My wife and I spent a few weeks camping in the Sierra Nevada mountains of California. 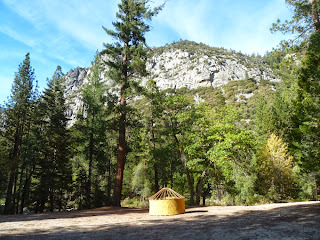 We started out at Kings Canyon National Park but were kicked out because of the government shutdown. After expulsion, we moved on to the Sequoia National Forest where they allow dispersed camping, that is, camping somewhere other than at a designated National Forest campground. We were now entirely on our own for amenities since the NFS wasn't providing any. 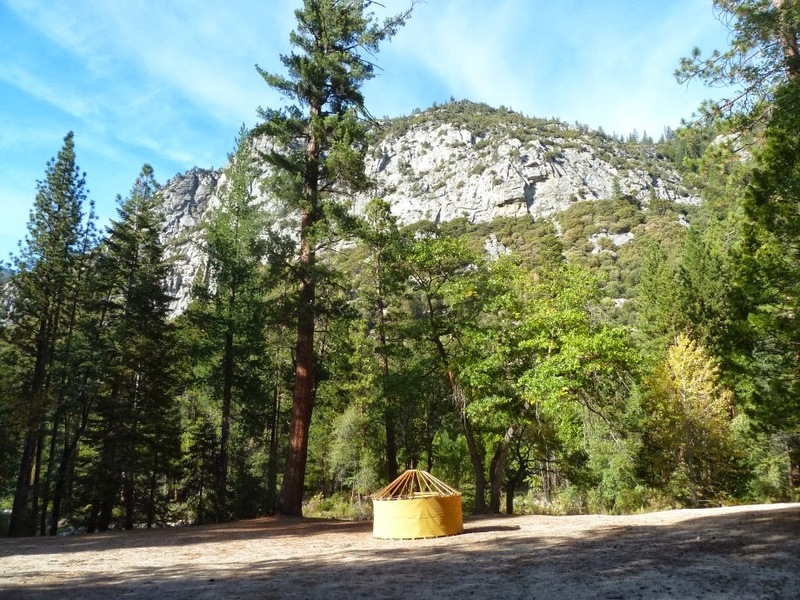 That is, other than a spot to park your car and pitch your tent, the forest service wasn't providing anything, no toilets, no water, no garbage cans, no bear boxes, no pavement, no wood. 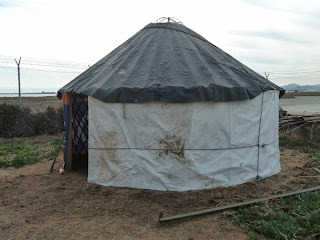 Worse yet, because of a prolonged drought, we could not build fires either. 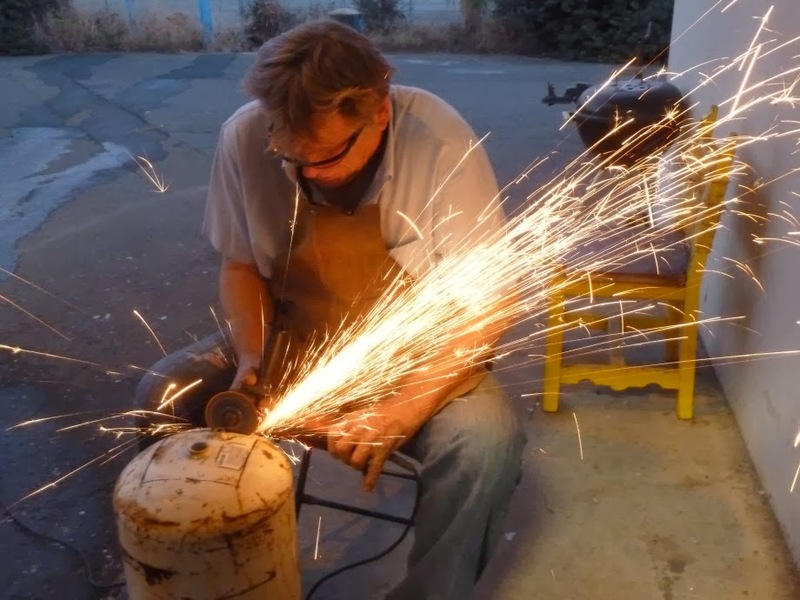 We had to stick with our propane fired camp stove. 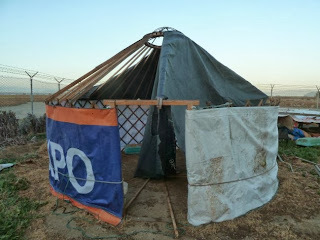 We were able to manage without toilets and had enough drinking water to get us through a few days at a time before needing to replenish. 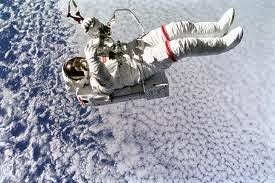 But in a way, we were back in space travel mode. Absolutely everything we needed to survive had to come out of our space module, the family car. 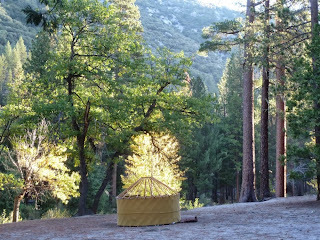 The yurt after our relocation to Sequoia National Forest. Not that camping in a National Park was any better. If anything, under normal conditions, it was even more restrictive and artificial an experience than camping in a national forest. In a national park, you are not supposed to interact with the environment in any way. 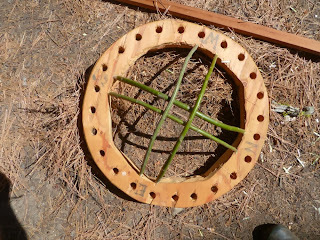 You can't burn the wood, you can't pick the plants. You can't hunt the animals, nor feed them, though apparently, you can do some fishing where there are fish. Mind you, I am not criticizing National Park policy. I am simply stating the effect it has on the experience of being there which is that it is not meant to be an environment that will support human life. It is an environment that tries very hard to minimize human impact. Any self sustaining activity other than fishing is in effect prohibited. 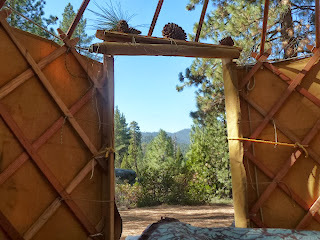 To return to the space travel metaphor, I don't know whether Star Trek with its prohibition of modifying alien cultures came up with this idea on its own or got it from the National Park Service, but there we were, camping without modifying the environment. For the most part, it's great to be in a national park because they manage to preserve the landscape in a state that resembles the state it was in before Europeans showed up. That is, besides some of the most stunning scenery, you also get to see what trees looked like before people cut them all the big ones down. And unlike the national forest, nobody is using the national parks as cow pasture. So far I haven't even mentioned backpacking. Backpacking gets even closer to space travel than car camping. 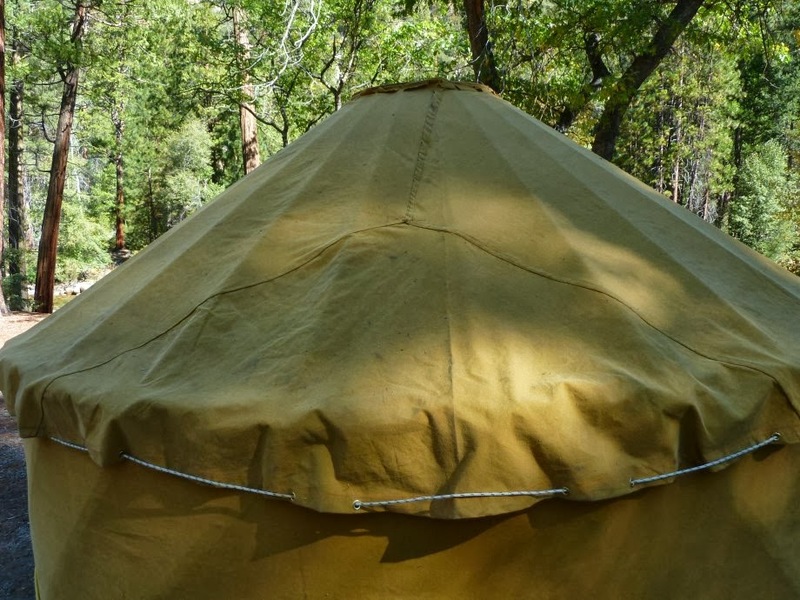 For backpacking, at least the way it's done these days, you need all sorts of specialized gear that you can only get in a high end camping store. Everything needs to be light weight, including your food which resembles the food of astronauts. But you can still have some sort of camping experience that doesn't resemble space travel if you are willing to be creative and accept the fact that you can't have humans invading an environment without having some impact on it.